Illustrated map of Chiang Mai is by the talented Chaloempon “Booklinn” Khuankhong. With a whopping 32,000 hotel rooms in this northern Thailand city, where do you even begin? The truth is, many travelers who pass through Chiang Mai just rent a room from a guest house for weeks at a time because it’s so inexpensive and there is plenty to explore. Some of us, however, are just visiting for a few days and are in search of more comfortable, but still affordable accommodations full of Thai charm and that’s exactly what I’ve detailed for you here. As a base, I suggest you find accommodations inside or within walking distance to the Old City, an area surrounded by a 700 year-old wall (see map above). Make sure your choice is on the tucked-away small residential streets because they offer a quiet stay removed from the noisy main roads. For central convenience, hotels near the Thapae Gate are best. 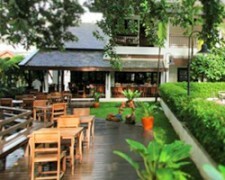 My top recommendation is the hotel where I stayed, the Thapae Boutique House. I think it’s the best mid-range hotel in the city with rates starting at $25 per night and discounts for a full week stay. 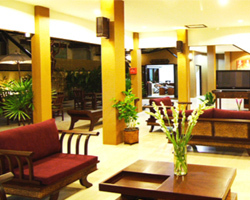 They offer free breakfast, wifi, a business center with computers, a coffee bar, and laundry services. It is in walking distance to anything you could need and all the popular markets. Further up the ladder in cost, the Baan Orapin Heritage B&B is $50 per night for Thai bungalows totally surrounded by tropical gardens while still within walking distance to the Thapae Gate. It’s the ideal setting and in fact won the 2013 TripAdvisor Travelers’ Choice Award. The Rimping Village Hotel is an excellent hotel for $75 per night offering free wifi, a beautiful pool and grounds, an on-site restaurant, coffee shop, spa, and business center. It’s a 20 minute walk to the Thapae Gate. If you are willing to spend $125-200 per night, some luxury Thai hotels await you, complete with western amenities and gorgeous grounds. The luxury hotels I recommend are the Tamarind Village Hotel, the Ping Nakara Hotel and Spa, the Puripunn Baby Grand Boutique Hotel and Siripanna Villa Resort and Spa. The first two are also winners of the 2016 TripAdvisor Travelers’ Choice Award. 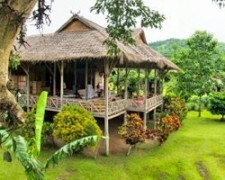 If you plan on doing a trekking tour, consider the all-inclusive eco lodges Lisu Lodge and Khum Lanna for $115 per night. They are located in the Chiang Mai countryside, with packages for those who seek trekking, rafting, cooking classes, Thai massage, and bike rides to local markets, farms and villages. They have no tv or internet but this is by far the most immersive and personal way you can experience the hill tribe and Thai farming culture. 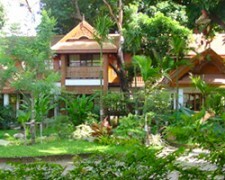 If you are looking for less expensive options such as hostels or guest houses, TripAdvisor is your best resource or refer to this list of Chiang Mai guesthouses, most of which are not featured anywhere else online. As always, thank you for reading. If you found this helpful in deciding where to stay in Chiang Mai I would be grateful if you could use the Agoda link below so I can receive a small commission that helps me keep this site running.